YAMBIO, South Sudan (CNS) — An attack on religious sisters at a teacher training college in South Sudan has shaken and saddened the church, a church leader said, while urging people of faith to demand the implementation of the latest peace accord to end the civil war. Violence and fear-mongering seem “rampant in both church and society” in the northeast African country, said Bishop Edward Hiiboro Kussala of Tombura-Yambio. Five armed men, believed to be allied to South Sudan’s main rebel group, assaulted and threatened religious sisters at the Solidarity Teacher Training College in Yambio, the capital of the country’s Western Equatoria state, Dec. 28. After climbing the fence surrounding the college, the men confronted the nuns, who were locking up the building for the night, and demanded guns, cash, phones and computers, De La Salle Brother Bill Firman, director of Solidarity with South Sudan, said in a statement. “Of course the sisters had no guns, but handed over the other items” and the men drove away in two cars, Brother Firman said. More than 100 people have been killed since May in Western Equatoria, which until then had been relatively peaceful in war-torn South Sudan. In early December, violent battles erupted between armed groups in Yambio. 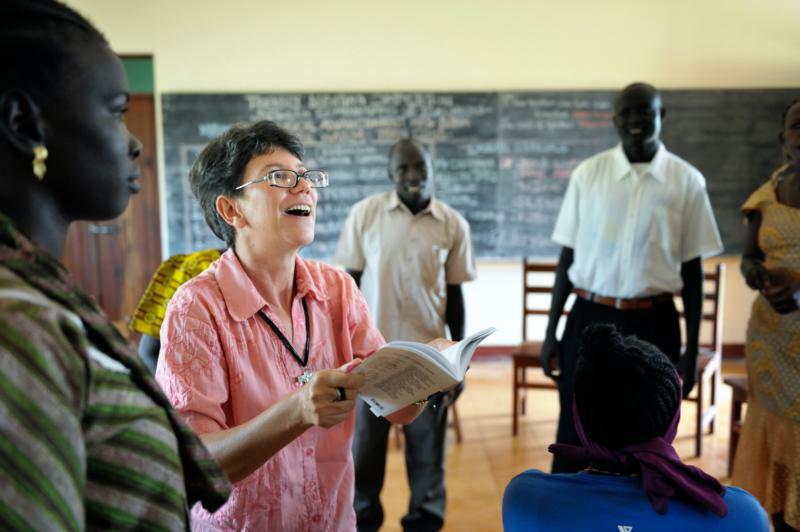 Solidarity with South Sudan is a Catholic missionary group implementing teacher and health training, agriculture, trauma healing and pastoral programs in many parts of South Sudan, under the auspices of the Sudan Catholic Bishops’ Conference. According to the Sisters of Notre Dame de Namur website, the Solidarity community in Yambio includes religious from different congregations around the world, including Montana and California as well as Ecuador, Ireland and New Zealand. Fifty students graduated from the college mid-November and were to teach in primary schools around South Sudan. Despite being offered the option of “withdrawing from this area that has experienced a rapid decline in law and order,” most Solidarity members have chosen to stay “as the college is one of the few signs of hope and providers of opportunity for the people of this disturbed nation,” Brother Firman said. While classes are set to resume Jan. 11, Brother Firman said he expects the number of students to be lower than before. “The insecurity and tribal divisions are making people unwilling to travel far” from home, he said, noting that “a return to unity and normal levels of security are essential” for people to be able to use the educational opportunities offered by Solidarity. Two years ago, fighting broke out in Juba, capital of South Sudan, between ethnic Dinka and Nuer in the presidential guard. This was months after President Salva Kiir, who is Dinka, fired his vice president, Riek Machar, who is Nuer. The conflict soon turned into an all-out war in which thousands of South Sudanese have been killed and about 2 million people have been forced to flee their homes. Noting that “not a day seems to go by without a news story that sends shivers down my spine,” Bishop Kussala said in a statement that he was devastated at recent attacks, including that on the religious sisters. A deep sense of tragedy “hangs in the air and, in addition to praying for the perpetrators, those killed, injured, harmed and all of their families, I find myself lamenting the lack of progress” in ending the attacks, he said. “We are called more than ever to be witnesses of hope,” he said. After attending prayer services at St. Teresa Cathedral in Juba Dec. 27, Kiir called for peace and reconciliation in the country, according to the Sudan Tribune. He urged churches, other faith-based groups and civil society to help his government disseminate messages of peace, reconciliation and forgiveness. In a New Year message, Machar assured the people of South Sudan that his rebel group is working to ensure that the August peace deal is implemented. While saying that Kiir’s creation of 28 new states without consultation was an obstacle to the accord’s implementation, Machar noted that 78 members of the rebel group arrived in Juba in late December and met with Kiir and other government leaders in preparation for further negotiations.